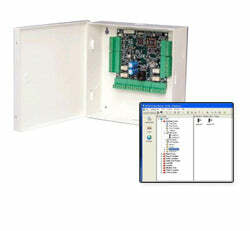 Linear E3 Telephone Entry System EN-2A4 / Linear Nortek EN2A4 Discounts Apply ! RFID Inside:Option to mount a reader internally for aesthetically pleasing end result. Easy Navigation: Stainless steel keypad with recessed illuminated blue keys. Polycarbonate home key with white illuminated backlighting. Outputs Times Hours, Min, Sec., by set time and or repeat quantity.